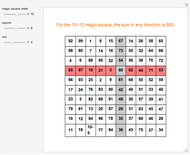 A magic square is a square array of the numbers 1, 2, …, arranged so that the sum of the numbers in a row, column, or either main diagonal is constant. 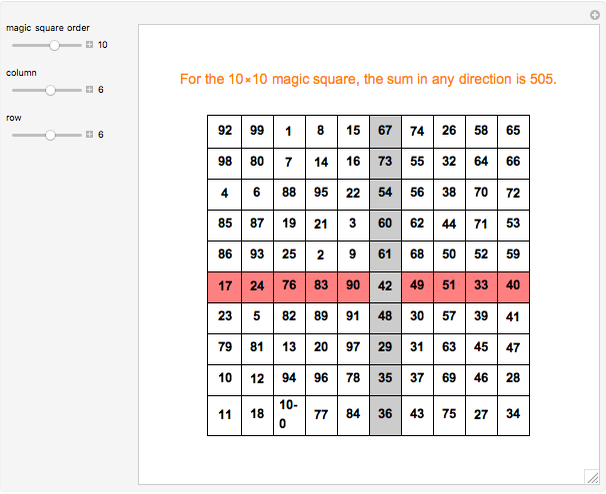 This Demonstration shows magic squares of any order up to 14. 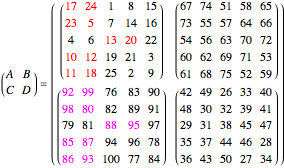 Different algorithms are used to generate the magic squares, depending on whether the order is odd, singly even, or doubly even (see Details). 3. ; here, " " is the equal operation yielding True or False component-wise, so that is a matrix of Boolean values. 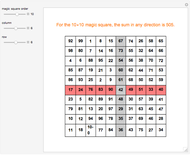 Define to be a matrix of the integers from 1 to , stored sequentially in rows. The elements in where is False are left alone, and the elements in where is True are reversed; that is, the value at a True position is replaced with . The elements in where is False are left alone. The elements in where is True are reversed; that is, at such a position with value , the new value is . So this is final result. 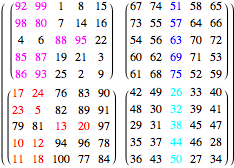 If is singly even, then is odd, and a magic square of order can be constructed from four copies of the magic square of order . 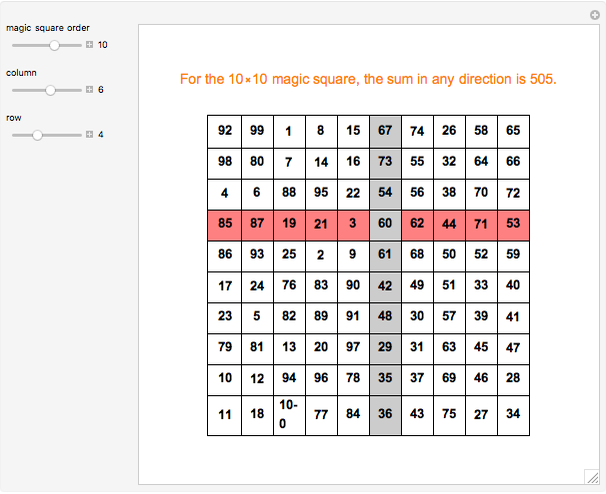 where is a magic square of order , , , and . 1. Swap the values of at , , and with the corresponding values of . 2. Swap the values of at with the corresponding values of . For instance, let , so . C. Moler, Experiments with MATLAB, MathWorks, Inc., 2011 pp. 129–132. www.mathworks.com/moler/exm. kguler. "Answer to 'Better Method to Swap the Values of Two 2-D Arrays'." 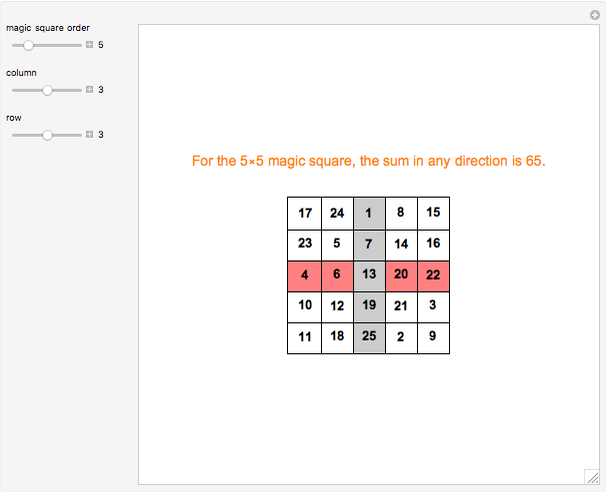 Mathematica Stack Exchange. 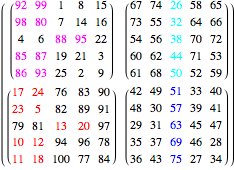 (Apr 23, 2015) mathematica.stackexchange.com/questions/80674/better-method-to-swap-the-values-of-two-2-d-arrays/80680#80680. 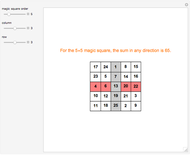 Shutao Tang "Magic Squares for Odd, Singly Even, and Doubly Even Orders"